Charge Has +6 Attack while damaged. Is Grommash somehow related to Garrosh? Nah, he's not raging for sure. One of my favorites in the game. It's that sort of card that just was there since the beginning and never got old. Perhaps the best Legendary card ever created. The most beautiful card in the game! "I can't trade no longer"
The most beautiful golden in the game in my opinion. Whoa. That was a tough month for me. Moved on another town, new apartment, education started. Had no time for reviews. Here it is now. "I can wait no longer" to review this legendary. Considering that Grommash Hellscream has Enrage, his stats distrubution is not that easy to calculate. vanilla 4/9 stats is 6.5 mana, +1 for charge, 7.5. If he is dealt, lets say, 1 damage, he will be 10/8, which equals 9 mana, +1 for charge, 10. Anyway, charge with 4 attack and 9 health is enough to take down popular little to medium stuff like Azure Drake, Gadgetzan Auctioneer, Totem Golem and so on, survive, and leave 10 attack on your board. If it gets enraged, it can kill most of minions in h, except very few. and maybe it can survive after that. Also, 10 damage with charge may be treated like living Pyroblast, but you have to have activation for it, which is 0-2 mana. Or a deathrattle that deals damage to board. Grommash Hellscream is use to be classic Control and Patron Warrior finisher. You fight for board, then, after ypu draw Grom, you think about lethal. After Death's Bite got cycled out of Standard, this legendary got, let's say, nerfed in some way, as well as Grim Patron. You still can use it, but it will be less convinient and efficient. This card still persists in Standard Control Warrior lists, but he uses Revenge as primary activation for its Enrage. Still good. Talking about Wild, i may say that it feels SO insane to play Wild Control Warrior. I crafted this legendary for a bet, but it really shines with Death's Bite, once again. If you have Grommash Hellscream in hand, you can stop smashin enemy board and awake our Inner SMOrc to start counting for lethal. Like, if you play the Axe in one turn, hit enemy face for 4, then next turn you cand drop Grom, hit face once again for additional 4, enrage the chrager with axe's deathrattle and deal 10 damage. So it will be 18 damage in 2 turn from empty hand. You might have board as well to push further. I managed to outaggro Beast-druid just because i got this combo in hand, so i wasnt very concered about his insane Stranglethorn Tiger + Mark of Y'Shaarj into Mark of Y'Shaarj+ Menagerie Warden combo, just becuase i had turn 8 lethal. In Patron Warrior it shines as well, just because it has so many spinners like Wirlwind and pinpoint damage dealers like Inner Rage, Blood to inchor, so enraging Grommash Hellscream won't be a big deal. So if you consider putting this legendary into your deck, make sure you have several ways of enraging it, not just use it on removing enemy minions. 1/3 of enemy health in 1 shot from empty board is a considerable reason to put such stuff in deck. 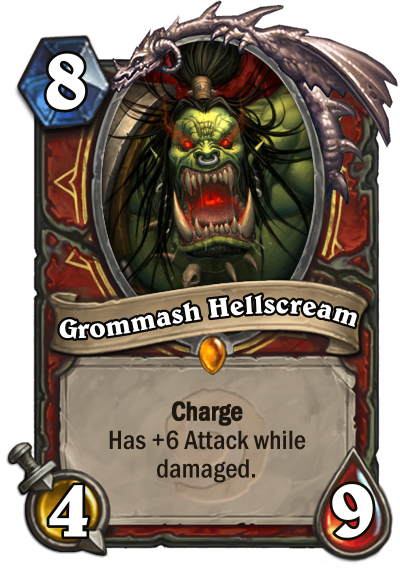 Hostile Grom can be stolen with stuff like Sylvanas Windrunner, Mind Control, Mind Control Tech and so on, and it will have Charge ability, if you didnt know, which means you can smash 10 damage to the Warrior back. Eye for an eye(not the secret). Another thing, is that if you play Paladin, Priest or Druid with Moonglade Portal, you can heal Grommash Hellscream back to 9 health to make him loose his Enrage. Or at least bite another acivation or hit on your minions. What else, if you cast Aldor Peacekeeper, Humility, Keeper of Uldaman on enraged Grommy, it will lose his enrage ability. Even if he gets hit after this change, he won't enrge to +6 attack. Strange, but good knowledge. Another thing that I discovered while playing Grommash Hellscream in Control Warrior is that it has very cool synergy with Ysera. She can give you Ysera Awakens and Nightmare, even several ones, so you have higher lethal range. Simple Awakens + Grom is 10 mana 15 damage(50% of life) with blowing most of taunts or defensive stuff away from Grom's way. Add some Nightmare to that, and it may be easy lethal outta nowhere. And his name is Grom Cena! Sorry for memes. let my memes be dreams. So, to sum up, lets say that if you lik playing Warrior(even aggressively-midrange), Grommash Hellscream is a good choice for crafting. You can use his potential in both formats, will always be able to play it in Standart with activations form Basic and Expert sets. I crafted it for a bet, but since then i'd feel the lust for this card that i didn't feel while hadn't had it. It really gives your warrior deck the edge.